One:	God is with you. All:	And with your spirit. One:	Lift up your hearts. All:	We lift our hearts to God. One:	Let us give thanks to God, our God. All:	It is right to give our thanks and praise. you were and are and always will be. in you, and with you, and beside you. came into being through you. to eat the bread and drink from the cup. verë, geenee, yah-een, krasee – and more! We are Christ’s people – no matter what! you call us back with your love. you call us back to your love. All:	And through Jesus the Christ! holy, holy, holy Lord, God of power and might. Heav’n and earth are full, full of your glory. All:	Take this and eat. This is my body, given for you. Each time you eat it, remember me. All:	Take this and drink. Each time you drink it, remember me. Two:	So we eat, we drink, and we remember. We eat, we drink, and we remember. Christ has died. Christ is risen. that they – and we – can be Christ’s gifts to the world. Give us, this day, our daily bread. One:	Jesus Christ, the bread of life! Two:	Jesus Christ, the cup of love. One:	The gifts of God, for all God’s people! All:	Thanks be to God! we thank you, God of all love! You are welcome to use these resources under a CreativeCommons Attribution, Non-Commercial, Share-Alike, 3.0 License. (For attribution, please use, "Richard Bott: liturgy.richardbott.com". Thank you! If you would like to include any of these in a commercial work, please contact me. 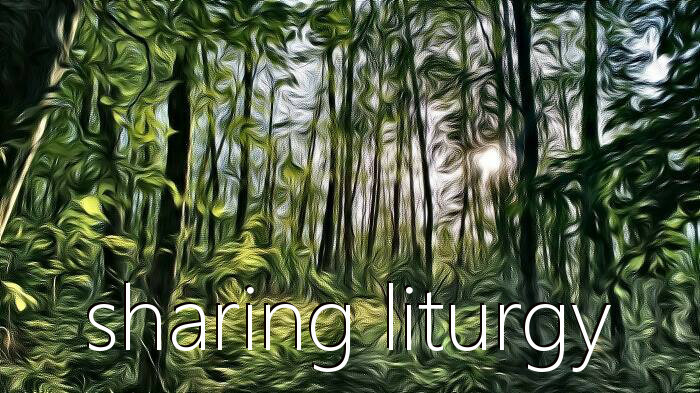 Although the calendar shows only four months, there are nearly ten years of liturgical writings and worship resources posted here. I'm still trying to figure out a better way for people to seek out resources, but using the search box to search by scripture (book and chapter), or a specific Sunday may get you started.